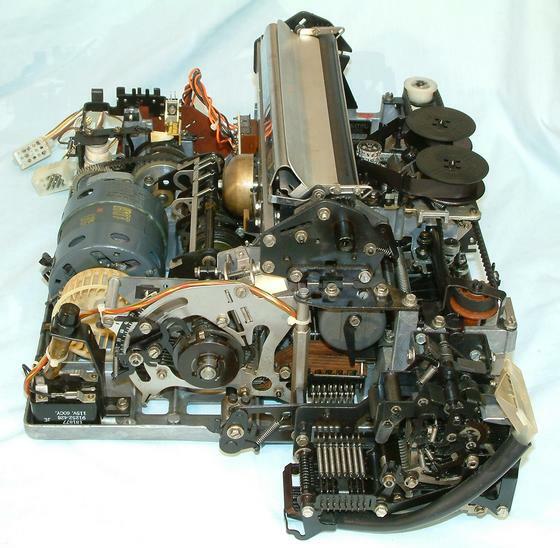 This is the left side of the ASR 33 Teletype teletypewriter set main assembly. In the lower right is the paper tape punch, between it and the platen is the dash pot used to stop the typing unit when it performs a carriage return. The black lever partially covers a hole used to adjust the air leakage to make the carriage stop smoothly. The black scale in the lower left towards the middle adjusted the timing of the serial data bit decode so the mechanism would sample them in the middle for the lowest error rate.